A new year brings new tastes and trends. What worked well in 2018 can suddenly be out of fashion in 2019. We showed you how to spot product trends before. We then used the same methodology to find the hottest products to sell online. In this new year, we want to help you find products and niche ideas that don’t require a huge investment to sell. Whether you’re starting a new online store or restocking your existing one, these ideas will help you get started with minimal outlay. The name popcorn for sweaters comes from the look of the stitches. According to Pinterest, pins with popcorn cardigans increased by 1,395%. Google Trends also show that people are interested in this product. It isn’t hard to guess what everybody is going to wear in 2019. If you sell knit clothing or women clothes in general, this trending product idea can make a great addition to your store. Don’t forget about look books for social media to present your product in the most favourable light. Hemp oil, or hemp seed oil (don’t mistake for CBD oil), is harvested by cold-pressing hemp seeds. Its nourishing vitamins and moisturizing qualities make it a great beauty product. It’s especially beneficial for skin health, as it has anti-aging properties. You can also sell hemp-based beauty products like masks, balms or body wash. Now people are more interested in organic cosmetics made of plain, natural components. Moreover, this interest doesn’t seem to fade away anytime soon. Hemp oil is not the cheapest product on our list, but the price is still affordable for a small business. Balayage appeared to replace ombré, and experts believe it will continue to be one of the beauty trends in 2019. This technique highlights hair to create a graduated, natural-looking effect. Hair dye isn’t the only product that you can sell to follow this trend. People need to take care of their hair after the dye, and stylists need tools to work with. So, don’t forget about coloring kits, cosmetics like color-protecting shampoos or conditioners and even hair extensions. Don’t you hate to clean a stove from the grease and spilt foods? Everyone does. Stove covers solve this problem effectively, what made them quite popular. Moreover, they are reusable and dishwasher safe. You basically will never have to scrub that stove anymore! For a store owner the best thing about stove covers is their price and weight. They’re really cheap and easy to ship. This is a great trending product to sell if you run a household goods store. Felt letter boards are customizable signs with movable letters of the alphabet. This way you can change the text on the board as many times as you want. It can be placed at home as a piece of decoration or at cafes or any other public places to provide some information, for example, Wi-Fi passwords. A great thing about felt letter boards is that you can DIY them. So if you already sell handmade products, think about adding letter boards to your store. You can experiment with colors, materials and sizes, providing your customers with a more personalized service. However, if you’re not into crafts, you won’t spend much on ready-made boards. The global baby product market is expected to reach $121 billion by 2025. People want the best for their children, which results in high demand for such products. Baby monitors help look after children, and this way parents can be sure their kids are safe. Moreover, people tend to use technology to simplify daily chores, and babysitting is no exception. A baby monitor is one of the most expensive products on our list, but it’s still a cheap electronic device to sell. So if you want to upgrade your store it’s an affordable item to consider. Gadgets tend to be as wireless as possible now, and it applies to security cameras too. No one wants to deal with wires anymore, so the interest in Wi-Fi and Bluetooth devices isn’t surprising. Moreover, as we said earlier, people like to use technology to make their life more comfortable and easier. Especially, when it comes to safety. If you already sell security cameras, you might want to add Wi-Fi ones to your store to keep up with the trends. If you’re planning to sell home appliances, this is your product too. If you could shave a few dollars off your electricity costs each month for a one-time investment of $5, wouldn’t you? That’s precisely the promise of dryer balls. These are fabric (usually wool) balls used in dryers to help dry clothes faster. The balls fill up with water, become heavy, and get in-between clothes, preventing them from sticking together in the dryer. As a result, there is more hot air circulation in-between clothes. This helps clothes dry faster, saving you time and electricity. Dryer balls have been around for years but have grown in popularity recently. This is partly due to increasing awareness of the environmental impact of electricity wastage. Fortunately, this is a cheap product to buy. You can buy them in wholesale from Alibaba for just a few cents. With the eco-friendly promise, this is a great product to sell in 2018. It’s no secret that air pollution levels are at an all-time high in major cities across the world. Your customers are obviously concerned about air pollutants in their private spaces — their homes, offices, and cars. In this context, car air purifiers are a fantastic product to carry in 2018. Increasing demand has brought down costs, especially for ionic air purifiers. New innovations have also helped reduce the form factor. Modern purifiers can plug into your car’s lighter socket without any modifications. Some even double up as a charging port. Given that air pollution shows no sign of abating, you can bet demand will continue to increase in the coming few years. They get in the way of your workout, fall out of your pockets, and somehow always end up in a jumbled mess. We’re talking about wired earphones, of course. There are few things as universally disliked as jumbled earphone wires, especially during any athletic activity. Fortunately, there is a solution now — Bluetooth earbuds. This product is in a hot niche — mobile phone accessories — and should continue to see growing demand for years to come. With record-breaking winter temperatures, you can bet people are struggling to use their phones with cold, numb fingers. It doesn’t help that conventional gloves are completely useless when interacting with a touchscreen. The solution: touchscreen gloves. These are specially designed gloves that allow users to operate their phones without exposing their hands. A small conductor built into the fingertips allows the gloves to conduct electricity, which is necessary for using smartphones. The demand for these gloves has shot up with dropping temperatures. The good part is that touchscreen gloves are affordable — both for retailers and customers. You can buy a pair from wholesalers on Alibaba for as low as $0.25/pair. You can even diversify into multiple sub-categories such as women’s touchscreen gloves, gloves for extreme cold, etc. But hurry up, the demand for this product is seasonal. Espressos, cappuccinos, lattes, and now, cold brews. This is the latest trend that’s taking over the coffee drinking world. Cold brew coffee is made by letting coffee grounds infuse in water for hours (often overnight). There is no hot water involved at any stage — a big departure from traditional coffee making methods. The good news for you is that cold brew coffee makers are a) in demand, and b) easy to retail. Usually made from glass or food-safe clear plastic, these coffee makers have a built-in infusion chamber for keeping ground coffee. Pop a couple of tablespoons of coffee, fill the bottle with water, and get a cup of cold, refreshing coffee in a few hours. The price, meanwhile, keeps dropping. You can buy cheap coffee makers wholesale for under $2. Given the world’s undying love for coffee, this is sure to be a hit product in 2018. You probably already know that vaporizers are immensely popular. We even included them on our hottest product list last year. The latest trend in vaporizers is to use vape cartridges. 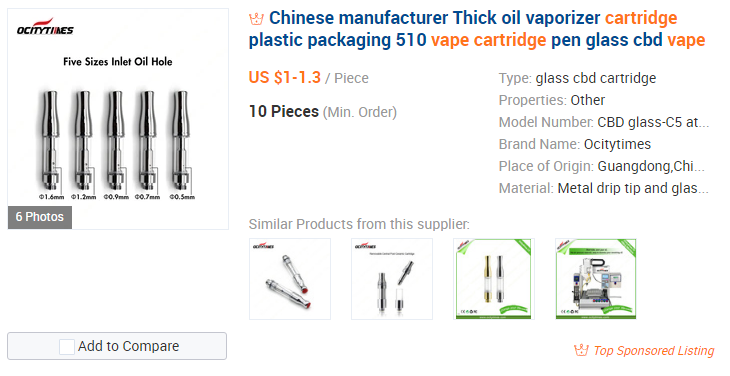 These can be either used in an eVape pen or a conventional vaporizer. Some of them are pre-filled with vaporizing liquids. Others can be filled with any liquid of your choice. Plenty of wholesalers will sell vape cartridges for $1 per piece (or even lower). If you’re looking for a low budget product with guaranteed demand in 2018, this should be one of your top picks. Light, affordable, and incredibly absorbent. That’s microfiber towels for you in a nutshell. Microfiber cloths have typically been used for cleaning purposes. The microscopic fibers that make up the cloth trap dirt and moisture, making cleaning a breeze. The price is competitive as well. Wholesale rates for standard-sized towels start as low as $1 and below. Moreover, this isn’t just a single product; it’s an entire category. You can easily expand to a number of related microfiber products — cleaning cloths, mops, dusters, etc. Smartphone accessories are getting more and more various. It’s not just about phone cases and protective glasses anymore. You already know that you can make outstanding pictures with the help of phone lenses. Now you can upgrade even your selfies. A special ring light for your smartphone allows taking selfies with the best lighting possible. While people use visual social media like Instagram, they will strive for high-quality pictures. You can provide them with tools for creating a beautiful feed, and selfie ring light is one of them. Shapewear holds ground for many years, so it can be a great investment if you sell clothes. It’s worn by women and men to create a slimmer look. There are different types of shapewear, like bodysuits, shorts, briefs, capris, tanks and even ready-to-wear pieces. There’re also lingerie-style shapers that are both functional and elegant. There’s also shapewear that people use for other purposes. For example, post-pregnancy belts that provide belly support. Or shapewear for training, that promotes weight loss. You can choose from different types of shapers to find the one that suits your store the most. These are medically-designed socks that help prevent the occurence or further progress of venous disorders. They increase the blood flow in lower legs which relieves swelling and pain. They are recommended for people who work at a desk all day, stand for long periods of time, exercise or travel by plane a lot. It’s quite a big group of potential customers. Apart from the health benefits, compression socks are timely investment. People are becoming more health conscious, and it applies not only to aging generations but to younger consumers too. It’s high time to join a health-oriented movement and provide customers with the products they are interested in. Luckily, you don’t have to spend a fortune to do that. Tourism industry has experienced steady growth almost every year. This means people are interested in products that can make their travel more comfortable and safe. That’s where waterproof backpacks step in. Besides, urban clothing and accessories also tend to be more functional now, so not only travelers want to keep their things dry. Another option is to sell waterproof backpack covers. This way customers can turn their good old backpacks into waterproof ones without buying a new bag. For the seller, this also means less expense, as covers are cheaper to ship. No matter which variant you prefer, it’s a great trend to try for your store. This is another example of a health-oriented trend. Fitness watches help to track the state of your health. For example, you can check if you have enough physical activity during the day. It helps to maintain a healthy lifestyle that so many people try to follow. Not to say, any product that helps to keep you fit, sparks interest among customers. Moreover, these devices are light and easy to ship, and they don’t cost much. In this way, fitness trackers don’t pose much risk in comparison with smartwatches or smartphones. Picking a low-investment trending product to start your store is a good way to improve your chances of success. What matters more is how you grow your store after the initial product selection. Some product ideas can easily be expanded to cover entire themes or categories (such as an 80s themed store). The beginning of a new year is a great time to test out these product ideas. Go ahead and create your free online store to start selling!